Connor Pack of Fairbanks slides safely into third base Monday evening. The Panthers rolled past Mechanicsburg, 16-4, in 4 ½ innings. Things looked a bit dicey for the Fairbanks High School baseball team after Mechanicsburg’s first go-around with the bat on Monday. The Indians roughed up FHS’ Mason Cushman for four hits and three runs while forcing the right-handed hurler to throw 25 pitches. The tension, however, began to ease during the home half of the initial frame. The Panthers responded with three runs of their own and went on to beat Mechanicsburg, 16-4, in five innings. Daniel Burchett got things started in the top of the first when he ripped a single to right field for the Indians. A base hit by Mack DeLong and a Panther fielding miscue left runners camped on the corners. Both base runners scored when Jake Edwards sent an 0-2 pitch through the infield for a single. Cushman got the first Indian out on a fly ball, but yielded a double to Aaron Conley that left runners on second and third. A groundball out by Blake Sadowski drove in the run that gave the visitors a 3-0 lead. Cushman got out of further trouble with a strikeout. The Panther bats came to Cushman’s rescue in the home half of the first. With one down, Hayden Hoover singled and took off when Connor Pack drove the ball against Indian starter Brock Hurst. Hoover ended up scoring and Pack slid safely into third on a ‘Burg error. 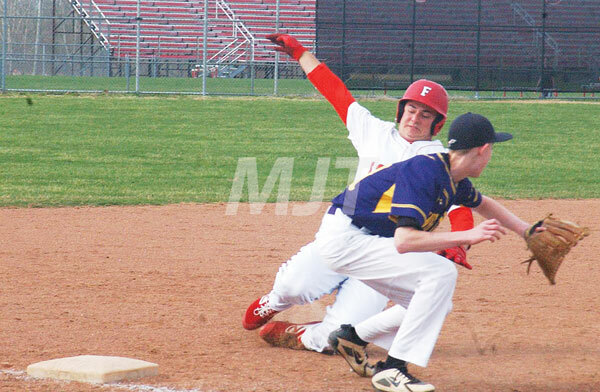 Cushman helped himself at the plate with a single that narrowed Fairbanks’ deficit to 3-2. Alex Jones reached on an error that put Cushman on third. Jones and Cushman executed a double steal, which allowed Cushman to tie the game at 3-3. Braxton Wilhelm singled and swiped second. He was later wiped out at third on a fielder’s choice. A foul ball out helped Hurst escape further trouble with the score knotted at a trio of runs. The Panthers were able to tie the game in part due to their aggressive nature on the base paths. The Indians reclaimed the lead in the second. Hurst singled and JD Swenson reached on a fielder’s choice which produced the first Indian out. Burchett ripped a base hit that sent Swenson to third. Cushman fired a wild pitch that permitted Swenson to score and break the deadlock. The Panther pitcher juiced the sacks with a walk, but induced a groundball for the final out of the inning. Fairbanks’ bats really got untracked in the home half of the second and began to open up the game. With one down, Jaeden Eickhoff was issued a free pass. He stole second and went to third on Hoover’s base hit. Pack singled in a run and Cushman followed with a double that brought in two. Jones singled in the final run of the frame that pushed the Panthers out to a 7-4 lead. Cushman, who had thrown 44 pitches during the first two innings, retired the Indians in order during the third. Hurst, who sent 55 offerings to the plate during the same time, was chased from the game in the bottom of the third after yielding base hits to Grant Rausch and John Pastirzyk. Both advanced on a wild pitch. Sadowski took the bump in relief and promptly walked Eickhoff. Hoover singled in a run and kept the bases loaded. Pack was plunked by a pitch that brought in a run. Jones singled in a run and two more were tallied on Wilhelm’s double. By the time Sadowski got the second and third outs on a muffed squeeze play and a grounder, the Panthers had climbed to a 12-4 advantage. Cushman allowed a harmless single during the fourth inning. The Panthers got to thinking about the run rule in the bottom of the fourth frame when four runs were tallied against Burchett, the Indians’ third pitcher of the day. Rausch led off the fourth with a single and went to second on a wild pitch. With one down, Eickhoff walked and Hoover reached on an error that loaded the sacks. Rausch scampered home on a wild pitch and two more runs motored in on a single by Pack and another Burg error. Fairbanks’ final run came with two down on Jones’ single. Cushman got the first two outs in the top of the fifth before he was touched by back-to-back singles from Conley and Sadowski. The game ended with Cushman fanning Noah Wolf. Cushman surrendered nine hits, but kept his pitch count down to 42 over the final three innings. He struck out three and walked one. The trio of Indian hurlers was touched for 16 hits. They struck out one and walked three. “We got our bats going and we were able to hit the ball more consistently than Mechanicsburg did,” said Rine. The Panthers (6-3 overall and 3-2 in the Ohio Heritage Conference) will travel to Southeastern today.